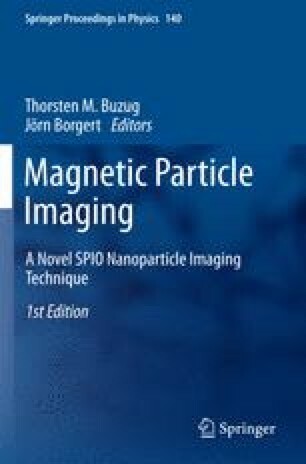 Aim of this study was the investigation of the suitability of magnetic multicore nanoparticles (MCNP) for magnetic particle imaging. For this, MCNP of different cluster sizes were investigated. To obtain a set of samples which differ in their cluster sizes the MCNP were classified into fractions of different mean sizes by centrifugation. By the fractionation particles with hydrodynamic diameters from 100 to 800 nm were obtained. Magnetic measurements confirmed a correlation of the hydrodynamic size with the effective magnetic volume of the particles in these fractions – e.g., with increasing particle size the coercivity of the particles varied from 3.5 to 25.8 Oe. Magnetic particle spectrometry investigations showed a clear dependence of the quality of MPS signal on the hydrodynamic diameter of the particles and thus the cluster size. In particular the amplitude ratio of the higher (15...40) harmonics to the 3rd harmonic span over one order of magnitude, where the smaller MCNP showed the highest values.